Fantastic view of the lake as well as the state park! King bed in the master, queen bed in the second bedroom, twin trundle and twin bed in third bedroom. Includes full kitchen, washer/dryer, gas fireplace, and private lakeside balcony. Complex offers Pool and boat docks. Launch and trailer parking available at PB 1 for a small fee (573-302-1044). 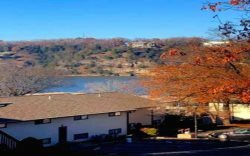 This condo is located at Park Place and offers some of the best views in Lake of the Ozarks State Park. Park Place is located at the 5 Mile Marker of the Grand Glaize Arm.